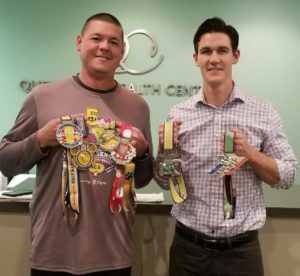 Earlier this month I completed the 48.6 mile Dopey Challenge and I could not have done it without the help of Dr Kyle Loveless and Dr Holly at Queen City Health Center here in Charlotte. When the miles starting building up I started feeling it in my lower back. After just a couple months at QCHC not only did they get rid of my back pain but they educated me on how to stay injury free for the rest of my training. Thank you Dr Kyle and Dr Holly for all you’ve done for me and my family and for your dedication to educating all of us on how to take care of our bodies the way God intended. I have had a terrible time with sciatic nerve pain on both sides due to terrible knee problems. My left knee will be operated on on May 22nd, but I have been worried about how I will recover from the surgery if my sciatic nerve is so painful. Went to Dr. Kyle Loveless on April 3rd and 4th. I was able to sleep last night with minimal pain and amazed at how much he has helped to relieve my pain. Thank you Dr. Loveless and Ilook forward to feeling better instead of worse in the future. Dr. Kyle you are a great Chiropractor and I rate you with 5 stars! When I first came to Queen City Health Center, I had very bad spine alignment and deterioration caused by a car accident. After the accident, I suffered from extremely bad vision due to multiple strokes, severe pain, decreased mobility and lack of coordination. I was prescribed multiple medicines by doctors, went through surgeries, physical therapies, but nothing seemed to help. My digestion was negatively affected as well. The results I have had since seeing Dr. Holly are so amazing. Words cannot even begin to express. I feel better every day. Before chiropractic, I always felt miserable and lethargic. Until I bean experiencing such great results, I didn’t realize how bad off I was. Dr. Holly has been amazing! I love her and her spirit. It’s nice to be able to come into an office for healing and immediately step into such a positive environment. In fact, this whole experience has been so life-changing for me that I am seriously considering finding a chiropractic school. | Nicky B. In late 2014, I started experiencing shoulder pain. It prolonged for about 2 months and was affecting my everyday movements. It prohibited me from lifting my arm above my head and caused me to skip a lot of workouts. My family referred me to Dr. Holly, and I started getting adjusted. Now my shoulder pain is completely gone. I love the team at Queen City Health Center. From the moment you walk in to the moment you leave, you feel welcomed. | Alek B. Before coming to Dr. Holly at Queen City Health Center, I was suffering from an elbow injury that hadn’t healed for 9 months. The doctors said it was due to a slow healing process in my body from Type II Diabetes and that it may never heal. I started doing corrective care chiropractic adjustments and the nutritional recommendations prescribed by Dr. Holly and within one month my elbow was completely healed and I had to start reducing my diabetes medication because my A1C was so low. I continued following the recommendations and within 3 months I was completely off my diabetes medication, lost 18lbs and was back to golfing on a regular basis. Thanks to Dr. Holly and her team! | Philip F.
Dr. Holly on WBTV news! I became chronically constipated around last April. My stomach became distended and I looked like I was 6-7 months pregnant. I felt like my food was in my chest all the time, because there was nowhere for it to go. I gained 10-15 pounds in a matter of a couple months. My legs swelled and my clothes didn’t fit. I took Amitiza – it helped with a couple episodes I had, and then all of a sudden, it happened again and the drug simply didn’t work for me. The constipation didn’t cease. I saw my old acupuncturist in Miami – he gave me herbs. It helped for a little while, but it didn’t fix it. I knew I had a serious problem. Then I saw Dr. Holly. It took about 2-3 months of care, but all of a sudden, I was able to “go” again, and regularly. I now feel like my “normal” self again and cannot begin to tell you how drastically different it feels, versus how I felt the last 6-8 months. I’m so glad I pursued this treatment instead of meds and whatever else docs would have had me do or take. Dr. Holly showed me what was wrong with my spine and how it contributed to the problem, which helped me understand that Chiropractic care would work, as long as I stuck to the plan. It was hard at times, because it certainly didn’t happen overnight. However, she helped me remain positive that it would work and really was my biggest cheerleader. I believe everyone should get their spine checked. | Andrea H.
Chiropractic care gives me instant and long-lasting relief from the symptoms. I love getting adjusted. I am so fascinated and impressed with the natural health lifestyle. God made our bodies so wonderfully. Chiropractic is a great way to maintain our health. It’s the only thing beyond essential oils that help me. | Megan A.
I have friends and family members who don’t believe in chiropractic care, but I think they’re crazy. Every time I hear one of them say chiropractors are quacks, I immediately go into defense mode. I have always been passionate about alternative health, and when I first heard Dr. Holly speak, everything she said just clicked. It made too much sense to ignore, and my results are proof that your spinal alignment really makes a big difference in your overall health. I started seeing Dr. Holly when I was about 6 or 7 months pregnant. We were planning to give birth naturally, at home, and I wanted to do all I could to ensure a smooth experience. When she told me that chiropractic care could shorten my labor by as much as 12 hours, I was sold. I had the most amazing homebirth, and I truly believe that Dr. Holly’s care in my third trimester can be partially attributed. Most pregnant women don’t sleep a wink in their third trimester. I slept like a baby. After my little girl was born, my milk didn’t come in right away. After 8 days of worry and frustration over not being able to breastfeed, I went in for my first postpartum adjustment, and that night, my milk came in. I have since referred my mom as well as my brother and sister and their families to Dr. Holly, and they have also had great results. Not all chiropractors are created equal. If you’re looking for a sound, holistic, wellness physician who can help you change your health and life without surgeries and toxic medications, Dr. Holly is the one to see in Charlotte! | Selwa L.
I threw out my back several months ago; the pain was worsening and had gotten so severe I was unable to bend, lift anything, walk or sit for long periods of time. When I started with Dr. Holly I was also taking medications for pain, high cholesterol, high blood pressure, depression/anxiety, insomnia and diabetes. After the first adjustment I was able to bend over and walk normally — it was like a miracle. I continued with the treatments and within a month I stopped taking the medications for cholesterol, blood pressure and pain. After stopping the medications I finally could think clearly and had enough energy to start working out. I’m excited to see what will happen over the next couple of months in treatment! | Doug B.